Miklós Rózsa was one of the best film composers whose vast library of works is mostly unknown. Despite having written scores for dozens of movies, he's mostly recognized for his work on the grand biblical epics "Ben-Hur" and "King of Kings," from 1959 and 1961, respectively. While the 1997 Blue Knights chose the most famous of Rózsa's film scores as the basis of "Selections from Ben-Hur," the corps also picked two of the least known works by Samuel Barber to fill out the show. The combination of the two disparate composers worked so well that the staff apparently decided there was no need to mention Barber's works in the title. And, indeed, the two Barber selections do sound that they could have been in the movie. One element that tied all the pieces together were the eye-catching hand-painted flags. Each time a new design was unveiled in the show, one knew it would become the center of attention. The corps opened up this ninth place show with a brash fanfare of the "Ben-Hur" main theme, leading into "Overture." Though the show was not a literal interpretation of any part of the movie, the time period was conveyed by the modernized Roman look of the color guard costuming. One of the most beautiful musical moments on the field that year was when the brass section formed a block toward the upper right corner of the field, briefly knelt down and then on an angle to the backfield played a soft prayer-like chorale. The melody was identical to that of the opening fanfare, but much quieter and a great deal slower. A grand restatement of the opening fanfare saw the brass encircled by the flags, prior to moving into Barber's "Lithe Girl, Brown Girl" from his 1971 work, "The Lovers," originally set to the sensual poetry of Pablo Neruda, a Chilean winner of the Pulitzer Prize. Appropriately, the color of the flags matched the title of the selection. 1997 Blue Knights performance excerpt. The somewhat erudite and intellectual music of Barber fit in well with the image the corps was trying to cultivate as a thinking person's drum corps. It required some thought from audience members for them to get in the groove, rewarding them only after an effort was made to listen deeply to the sonorous phrasings and cerebral melodic lines. Søren Kierkegaard is often thought of as the first existentialist to make an impact on the world of philosophical thought. His writings, full of angst and despair, held a certain appeal to Barber, and by extension could possibly have influenced some of the more recent shows by Blue Knights that explored the darker side of musical and human existence. "Father in Heaven" (from "Prayers of Kierkegaard") featured minimal movement from the brass players, focusing on the stark and haunting simplicity of Barber's introspective melody. Seven hand-painted banners, each well over 10 yards long, were pivoted into position on an oblique and set down on the field to become one huge illumination of light piercing the profoundness of existential existence. 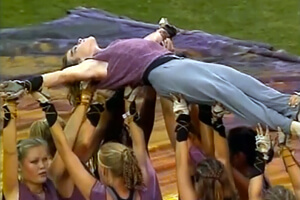 What came next was a deeply spiritual moment for many corps fans; a lone figure signifying the crucified Christ was passed over several color guard members and then laid down upon the rays of light, with the rest of the guard paying homage in silent affirmation. Musically and visually, this was a moment of spectacular beauty, one to which words truly can't do justice. Turbulent strains from "The Battle" from "Ben-Hur" led into a final statement of the opening fanfare theme from the film, replacing all the prior torment and sorrow with a jubilant proclamation of hope and triumph. This week only, you can save on 1997 World Championship Audio and Video Performance Downloads on the DCI Fan Network. Buy the 1997 Blue Knights Video Performance Download. (Available this week only for $3.99. Regular price: $4.99.) Buy the Audio Performance Download bundle of all 12 Finalists from 1997. (Available this week only for $15.99. Regular price: $19.99.) Offer ends Monday, Nov. 21 at 8:30 a.m. ET. Michael Boo was a member of the Cavaliers from 1975-1977. He has written about the drum corps activity for more than a quarter century and serves as a staff writer for various Drum Corps International projects. Boo has written for numerous other publications and has published an honors-winning book on the history of figure skating. As an accomplished composer, Boo holds a bachelor's degree in music education and a master's degree in music theory and composition. He resides in Chesterton, Ind.